· ORIGINAL BLACK AND WHITE “SWIRL VERTIGO LABEL (SWIRL ON ONE SIDE, BLACK AND WHITE ON THE OTHER). · THIS IS THE ORIGINAL, AUTHENTIC, FIRST U.K. PRESSING; THIS IS NOT A REISSUE, AN IMPORT, OR A COUNTERFEIT PRESSING. · ORIGINAL "TEXTURED" (COARSE, NOT SMOOTH OR GLOSSY) COVER. In the great lottery of pop, a question that frequently has to be asked is why one group and not another? 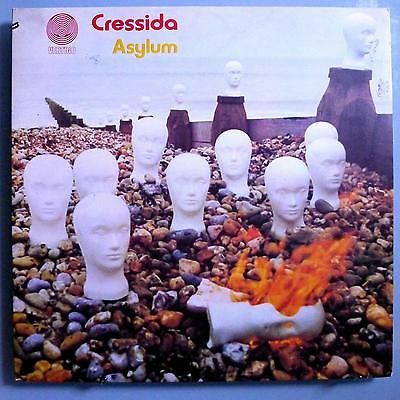 Why are groups such as The Moody Blues, King Crimson and even dear old Gentle Giant venerated, while equally lyrically and musically powerful bands such as Cressida are left, discarded as the forlorn dummies heads on the beach on the cover of Asylum? It is a hard question to answer at the best of times and even harder when you reacquaint yourself with the group's small but perfectly formed oeuvre. By 1969, the decade-and-a-half-old form of rock and roll was clearly here to stay. The music had already traveled from the 2:30 jangle about love into song cycles, heavy riffing and, thanks to the proliferation of psychedelic substances, a new mysticism. Summers of love had been and gone and even places like Beckenham in Kent were having free festivals. A man had landed on the moon and on record, the cosmos was the limit. With their name taken from Greek mythology - the daughter of soothsayer Calchas, Cressida betrayed her eternal love Troilus, of whom Shakespeare wrote so eloquently – the group are one of those glorious footnotes that make progressive rock so very interesting. There may be few today who can recall the power and the glory of Cressida, but the music they offered during the brief sliver of a recording career is truly more than ripe for reappraisal. The group was formed in the late 60s by keyboard and mellotron player, Peter Jennings. Adding Angus Cullen on vocals and guitar, John Heyworth on guitar, Kevin McCarthy on bass and lain Clark on drums, the group gained a reputation as a fierce live act, their music full of delicate passages and interludes of storming complexity. With Cullen's sweet, lyrical voice and an obvious nod to The Moody Blues, Cressida became one of the first signings to Vertigo, the recently-founded progressive rock offshoot of Polydor records. Vertigo were very much in the mould of forward-thinking new record labels, well away from the suited and stuffy mainstream. With an almost arbitrary A&R policy (Patrick Campbell Lyons from the original Nirvana scouted for the label for a while), Vertigo sought to release music by acts that reflected the Zeitgeist perfectly. All with that incredible spiral logo revolving on the label: if the music didn't blow your mind, then the graphics certainly would. So, after releases by Colosseum, Juicy Lucy, Manfred Mann, Rod Stewart and Black Sabbath, Cressida's eponymous debut album, (VO 7) became the seventh release on Vertigo. Their second album, Asylum (Vertigo 6360 025) released later that year, was a very different endeavor from the first album. The album was a denser, darker affair, relying less on Cullen's vocals. Ex- Donovan, Ginger Baker's Airforce and John Martyn reedsman Harold McNair played on the album, adding to its deeper, lilting feel than its predecessor, which focused more on instrumental passages and elaborate arrangements. The subject matter was also far less mystical than their contemporaries. Munich (or to give it its full title, Munich 1938; Appeasement Was The Cry, Munich 1970; Mine To Do Or Die) is tremendous fun: with its subtle organ parts and great dual lead guitar as well, it can be seen as the group at their very zenith. Again produced by Byrne, Asylum featured orchestration and musical direction from Graeme Hall – who had recently also worked with Shadows offshoot Marvin, Welch & Farrar. The album remains the jewel in their crown Changes were afoot at Vertigo, and by late 1971, the group found themselves without a contract. Quietly, like so many of the era, they split up. Drummer lain Clark went on to play with Uriah Heep for a year and John Culley became a member of another lamented prog act, Black Widow. Paul Layton returned to simpler pastures with the New Seekers and the special guest who had so enlivened the instrumentation on Asylum, Harold McNair, was to die tragically from cancer in 1971. Little has been heard from the others since. The Vertigo label, ironically, was reactivated by Universal in 2003 for bands such as The Rapture. We may never know why the group failed to ignite as some of their contemporaries; but what we do know, is we have two beautiful, much-loved albums. And whereas we might be over familiar with our copies of In Search Of The Lost Chord and In The Court Of The Crimson King, Cressida and Asylum are full of sweet, yearning and strange, unfamiliar surprises, yet to be discovered. (a) THE VINYL IS ABSOLUTELY, PERFECTLY MINT, as if never played before. The original luster is totally intact, and the vinyl shines and sparkles like brand new. The labels look perfect, simply gorgeous; the record is TOTAL PERFECTION - ABSOLUTE VISUAL NIRVANA! We are confident that, in this condition, the record we present here is truly once-in-a-lifetime find. (b) The record comes in a poly-lined Made-in-England Vertigo stock inner sleeve, which has - apparently with success - shielded the vinyl from the harmful impact of elements over many years!